This image of supernova remnant 0509-67.5 was made by combining data from two of NASA's Great Observatories. 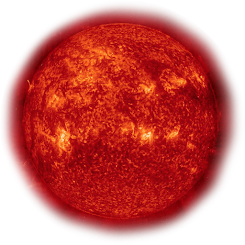 Optical data of SNR 0509-67.5 and its accompanying star field, taken with the Hubble Space Telescope, are composited with X-ray images from the Chandra X-ray Observatory. 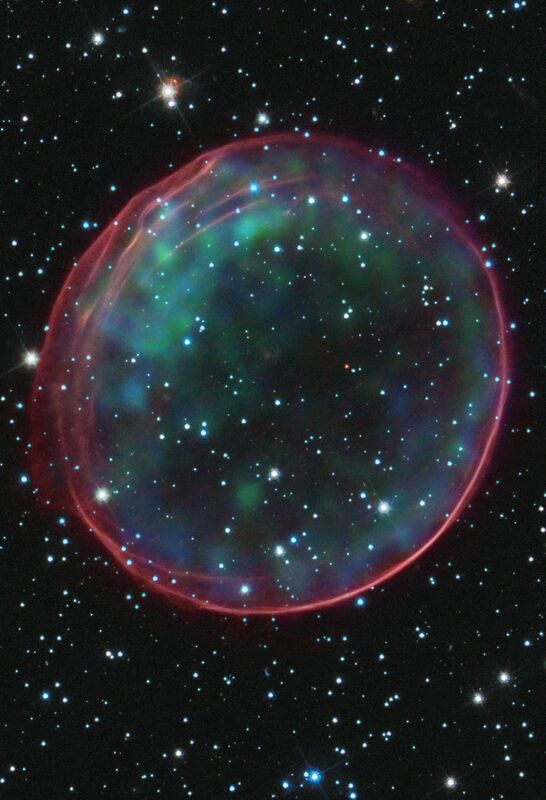 The result shows soft green and blue hues of heated material from the X-ray data surrounded by the glowing pink optical shell, which shows the ambient gas being shocked by the expanding blast wave from the supernova. Ripples in the shell's appearance coincide with brighter areas of the X-ray data. The Type Ia supernova that resulted in the creation of SNR 0509-67.5 occurred nearly 400 years ago for Earth viewers. The supernova remnant lies in the Large Magellanic Cloud (LMC), a small galaxy about 170,000 light-years from Earth. The bubble-shaped shroud of gas is 23 light-years across and is expanding at more than 11 million miles per hour (5,000 kilometers per second).